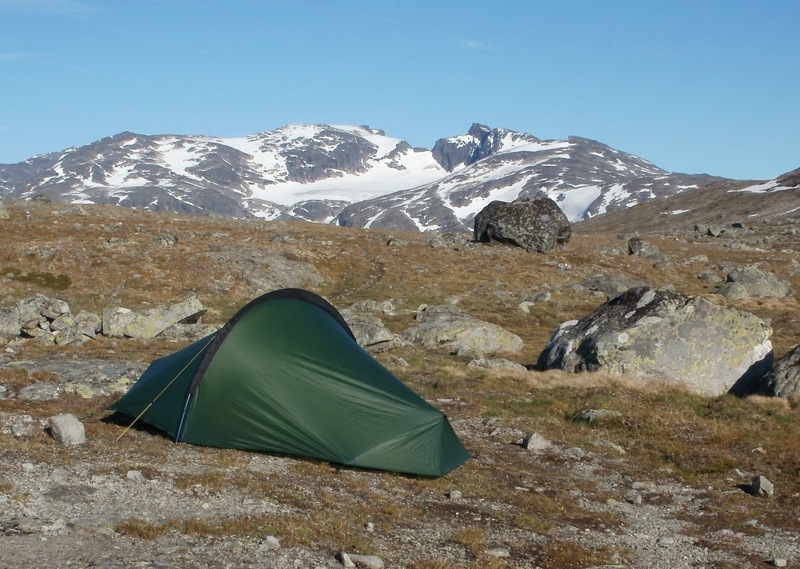 A 47-mile backpacking adventure through the Jotunheimen National Park, Norway, in July 2010. In summer 2010, my life was at a crossroads. I’d been working as a barman at the Clachaig Inn, Glen Coe, since 2008, but I needed a change – I was getting bored of the same old hills, and felt the pull of bigger mountains and longer trails. I can’t remember what first attracted me to Norway. Maybe it was the lure of true wildness, or the prospect of dozens of 2,000m peaks, many of which could be climbed by easy scrambles. My idea was to have a free-form adventure. I didn’t want to be constrained by a rigid plan – I just wanted to get out there for a good long time, up to a month, and climb as many mountains as possible. I had never been to Scandinavia before, and my mountaineering experience was limited to Britain (mainly Scotland) and the Western Alps. As I pored over the maps, I think I was expecting it to be rather like Munro-bagging in the Highlands. 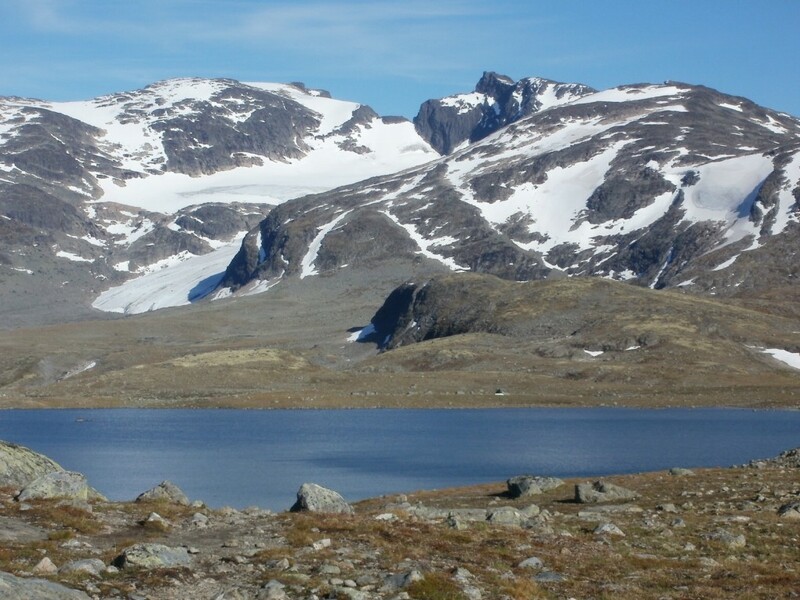 The first thing I found out was that, while there was plenty of information about backpacking in Jotunheimen, there were few resources in English about climbing 2,000m peaks1. In fact, the Scandinavian Mountains website was my primary source of info when it came to planning routes of ascent. I bought myself a copy of the Cicerone Walking in Norway guide and my parents gave me a Norwegian phrasebook for my birthday. Armed with two Turkart 1:50,000-scale maps of the Jotunheimen area, I started marking down likely lines of attack for the mountains I thought I would have a go at. 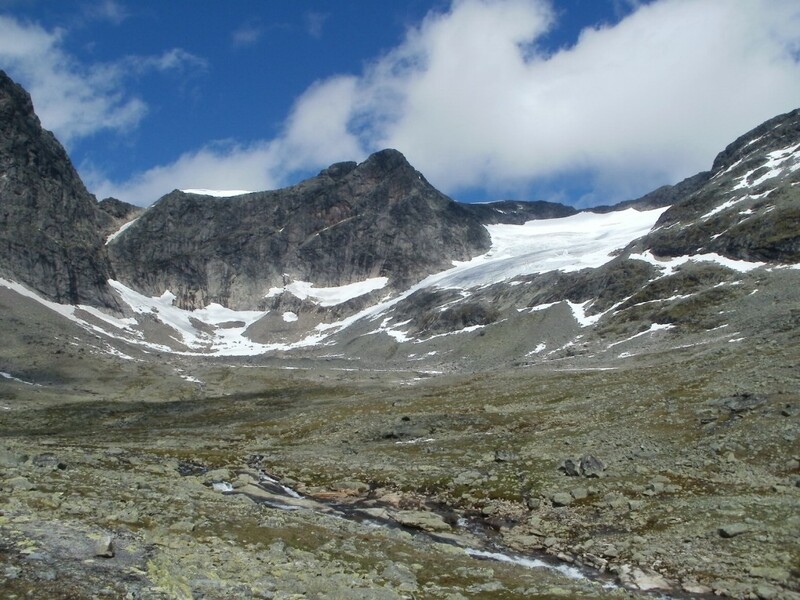 Although there is a network of footpaths in Jotunheimen, most of them don’t go anywhere near any mountain tops so I had to rely on the information gleaned from the web to plan my ascents. 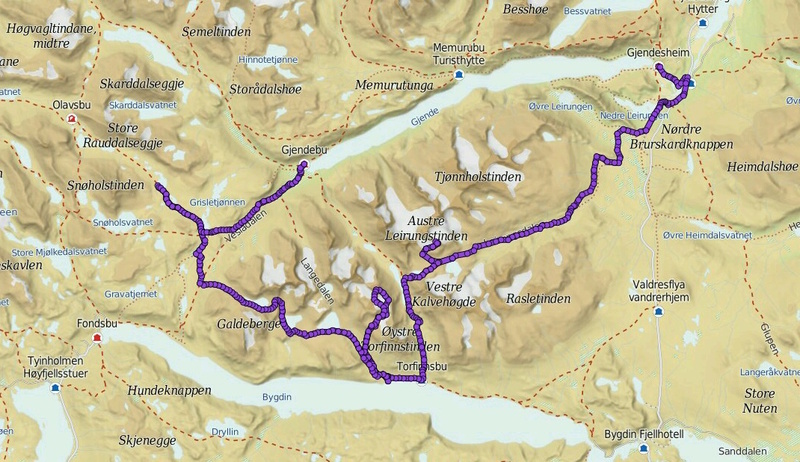 The route I took through Jotunheimen in July 2010, including out-and-back excursions. You can download a GPX file of the route here. The Turkart 50K maps aren’t as good as the Ordnance Survey maps of the UK or the Swisstopo maps of Switzerland. Although Turkart maps are very clear and easy to read, they lack detail. Given my inexperience with Scandinavia, the maps fooled me into thinking the terrain was considerably easier than it actually was: entire features were often missing, it was impossible to tell whether terrain would be a flat lawn or a boulderfield, and paths usually looked a hell of a lot more prominent than they actually were on the ground. The lack of detail in the maps, combined with my inexperience and enthusiasm for the trip, led me to plan quite an ambitious itinerary. By the time I’d finished planning, I had an idea of walking one or two hundred miles and ticking off fifteen or twenty 2,000m peaks. 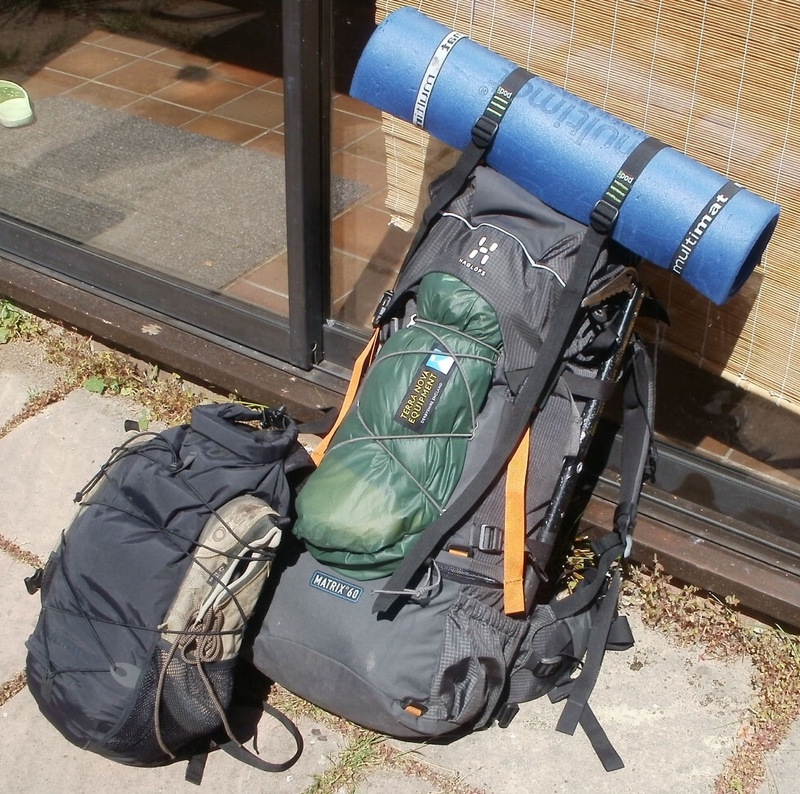 I’m afraid I never made a list of the gear I packed with me in July 2010, but I know one thing – lightweight it was not! This was long before my lightweight transformation. Equipment was selected for low cost and durability. I bought no special equipment for Norway, preferring to use my trusted gear that had performed so well in the Scottish mountains for years. Basically, I didn’t pay too much attention to the weight of my pack, and I didn’t try to optimise my gear list for the conditions I’d be encountering. To be honest, I couldn’t really afford to buy any new gear, so it was a case of either use the stuff I had or not go at all. My rucksack ended up being crammed to the gills with a base weight of about 17kg. Add a week’s worth of food and two 250g gas canisters and the total weight was well in excess of 20kg. The trail journals that follow were all written in my notebook while actually on the trail. Weather: Fine, with light showers 16.00-16.45. A cold wind from the north-east. Today was my introduction to the Norse mountains, and it has been an eye-opener! Travel proved to be surprisingly easy. I flew from London to Oslo, and from there I took a bus to the town of Fagernes, where I camped overnight (a lovely spot on the edge of the lake, although the mosquitos were biting). The next morning I got up bright and early and caught a bus to the remote settlement of Gjendesheim on the edge of the mountains. There’s a DNT hut at Gjendesheim. 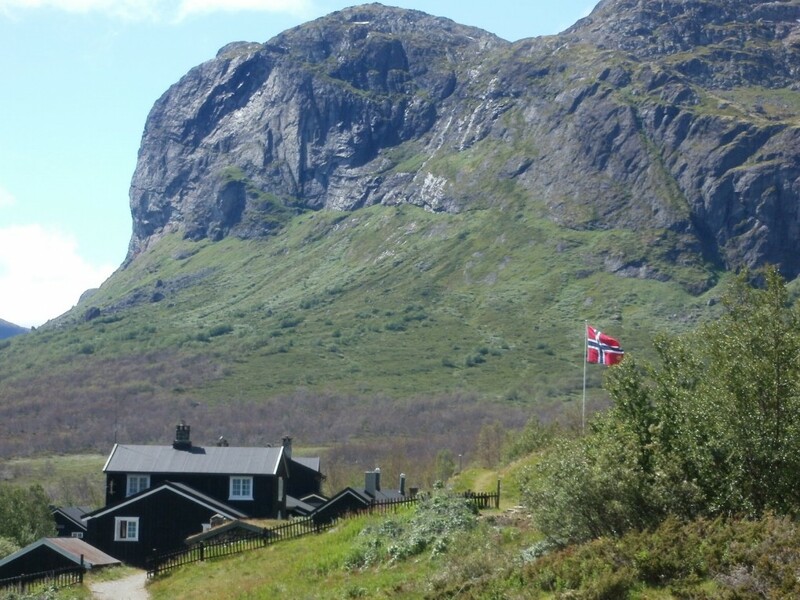 The DNT is the Norwegian trekking association, and they have a great network of huts throughout Norway – a bit like bothies, but much smarter, often staffed by wardens, and usually locked. Some of them sell food. I paid my £20 and picked up my DNT hut key at the lodge, which can be used to open any DNT hut. I’ll need this on my journey! I also stocked up on food (although they had no stove fuel, so it’s a good thing I bought gas canisters at the outdoor shop in Oslo). They did not, however, have much choice in the way of food, so I have pretty much filled my pack with Speltbrod (which looks like a kind of dry preserved rye bread). 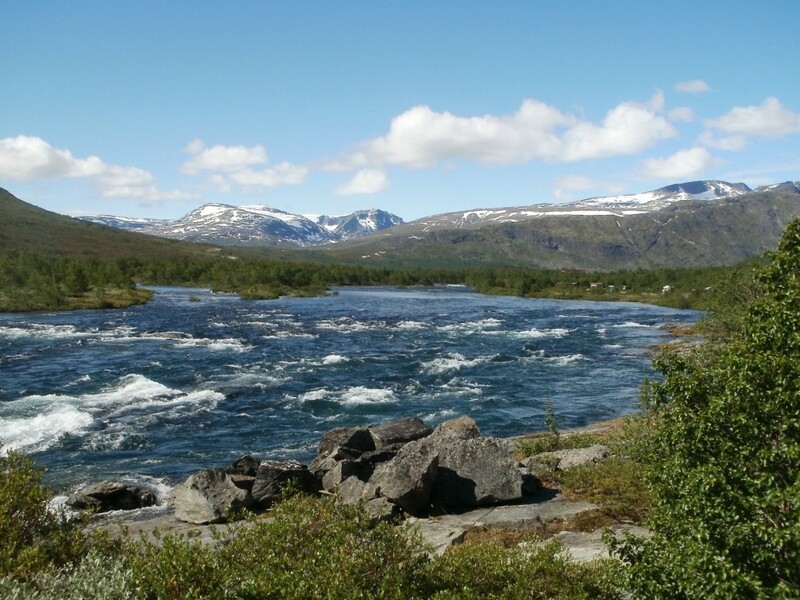 I left Gjendesheim in the early afternoon and began the journey into the Gjende Alps on the edge of Jotunheimen. The first surprise was that the ferry to cross the river no longer runs, which meant I had to make a three-mile detour down the road to the nearest bridge just to get to the start of the trail. There were plenty of other walkers about; most of the people I spoke to wanted to climb the Besseggen Ridge, or the mountain of Knutshoe. I did not see any other people with large rucksacks like mine. I passed through some ancient farms or crofts, and the wooden architecture reminded me of the grain barns in the Valais. Dozens of tiny caterpillars dropped on me from the birch trees as I passed through a copse, abseiling on threads of silk. Soon enough, the path took me away from the hordes of people walking up Knutshoe, and into a wilder place – a bit like Rannoch Moor, only much drier, baking in the overhead sun. I’d already used up my first litre of water and had to look for a stream to fill up and then treat the water with my Chlorine tablets. The path turned off into a little glen, and here the red DNT path marker instructed me to ford a river I did not like the look of – it must have been almost knee deep! I didn’t want to get my feet wet, so I kept going uphill through chest-deep dwarf willow, infested with mosquitos and evil little biting flies. I got quite irritable as I tried to follow the river up the mountain until it could be forded. In the end I followed it all the way up to the plateau. With the path now way below me, I did the only thing I could do in the circumstances: I contoured. Navigationally this section was not difficult, but the next few miles were incredibly rough, constantly crossing boulderfields and having to find ways over torrents and gorges. When I wasn’t muttering at my own idiocy in leaving the path, I caught views to my left, across the gulf of Leirungsdalen, and marvelled at the increasingly wild panorama before me. These mountains are absolutely beautiful. Glaciers tumble down from the plateau, which is pretty flat in most places although there are a few peaks rising up here and there in towers of shattered rock. 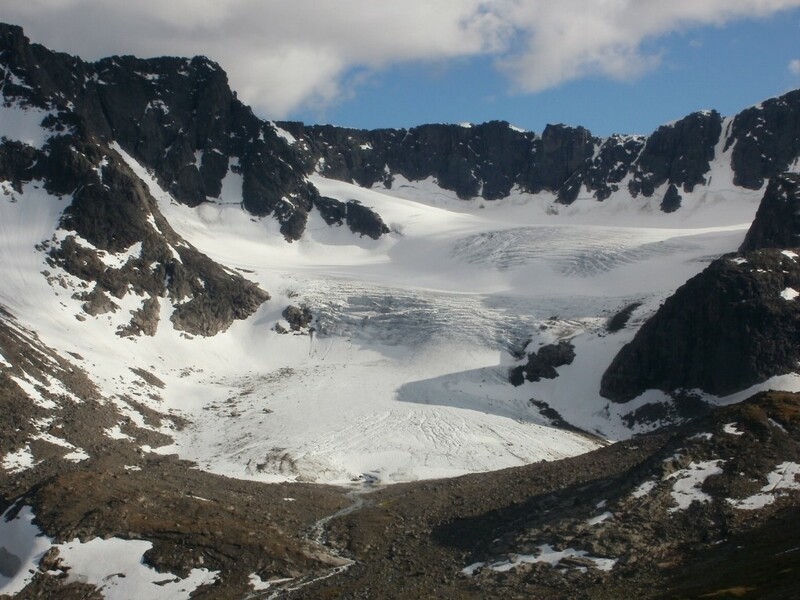 It looks a bit like the Cairngorms might do if you brought the glaciers back. Mugna in particular is like a giant version of Braeriach. At length I dropped down from my high contour and came to my campsite for the night. 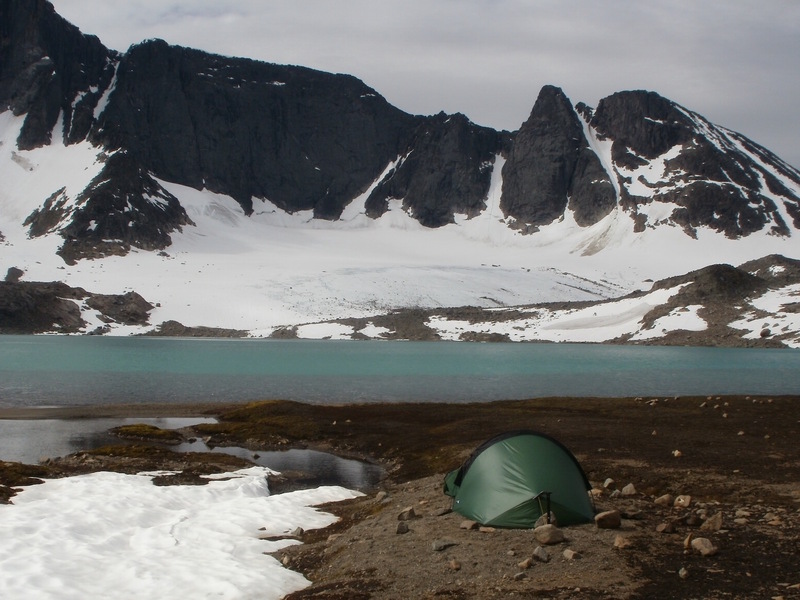 This loch, surrounded by glaciers and the mighty peaks of the Gjende Alps, is one of the best places I’ve ever camped. Across the water I can see the glacier of Vestre Kalvehøgde calving directly into the waters of the loch. Although the ground is very stony, I think I’ve managed to anchor the Laser Comp pretty well although I don’t fancy the idea of high winds in this exposed place. I hope to stay here for two days and climb some of the local mountains, before moving on to Torfinnsbu. Weather: Grim! Big snowstorm mid-day, continuing low cloud, drizzle and high winds. I hadn’t slept that well overnight, because it just didn’t get dark. The sun dipped below the horizon at about 11.00pm and popped up a couple of hours later, leaving a surprisingly bright twilight in between. The interior of my tent is bright yellow, which didn’t help. It’s worse than midsummer in Scotland! So, because I thought my planned mountain climb would only take me a few hours, I decided to sleep in. Big mistake! Austre Leirungstinden (2,268m) is one of the mountains on the northern side of the valley, guarded by a small glacier and a ridge which is apparently only a Grade 3 scramble. The website indicated an easy way up the scoured terrain on the southern side, more or less directly above the loch. By the time I left camp at 11.00am, some cloud had begun to drift in from the west and tug at the peaks on the other side of the valley. I made swift progress up the lower part of the climb, which was mostly open rocky tundra with one glacial torrent to cross and a few boulderfields, but mainly straightforward. At mid-day it started to hail and became very cold, and over the course of the next hour the cloud continued to build. At one point I looked to the north and saw a massive wall of cloud sweeping in; beyond it, nothing but blackness. When I reached 2,000m on the glacier (which was soft underfoot, no crampons required), it started to snow quite badly and the wind rose. Some fierce gusts pushed me about and blew snow in my face. I really wished I had my snow goggles and Dachstein mitts with me! Although I kept trudging on for a while, keeping a close eye on my compass bearing, I knew I had to make a decision. Despite being less than 300m from the summit, most of the remaining ascent was on an exposed scrambly ridge. It’s all very well thinking ‘only a Grade 3’ when you’re planning back in the UK, but in a snowstorm above 2,000m an unknown and unfrequented Grade 3 suddenly feels like a massive risk. So I turned back. By the time I got back to my tent, the clag was truly down and I was quite damp! Little drifts of snow could be seen everywhere, clinging to the lee of rocks and tussocks of grass, but I think the temperature was about 3-4 degrees and nothing really settled. I’m cooking some pasta now (already sick of Speltbrod). This looks like a real blanket of cloud. I think I shall wait at the camp until the weather improves, because I can’t really be climbing 2,000ers in this weather. Lesson of the day: WAKE UP EARLY! Weather: At first cloudy and very windy. Cloud began to lift and break at about 10.00am. From mid-day, fine with light Cumulus cover; blustery, at times extremely so. The weather was bloody awful last night. It has been much colder at night than I expected, and even wearing all my clothes I haven’t been warm enough in this sleeping bag, which is supposed to be two-season. The wind became ferocious, slamming into the broad side of the Laser Comp with massive gusts, and I often had to sit up and brace myself against the pole to stop the tent from blowing away. It was quite scary, to be honest. By early morning I’d had enough; this high camp was clearly impractical in high winds, especially for small backpacking tents. I decided to give up on the Gjende Alps and relocate my camp to somewhere more suitable for the conditions. 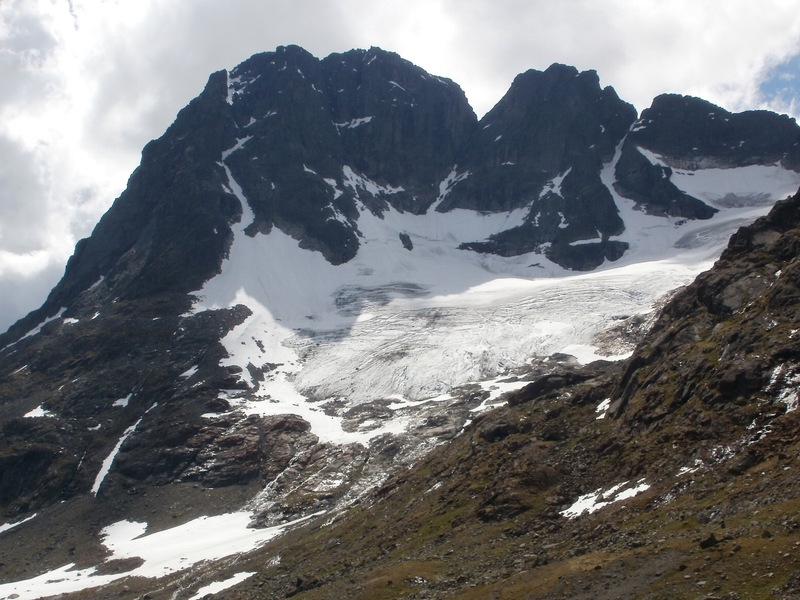 A shame: the glacier camp was magnificently wild, and I’d have liked to have climbed at least one of the mountains. At about 11.00am I started to strike camp. 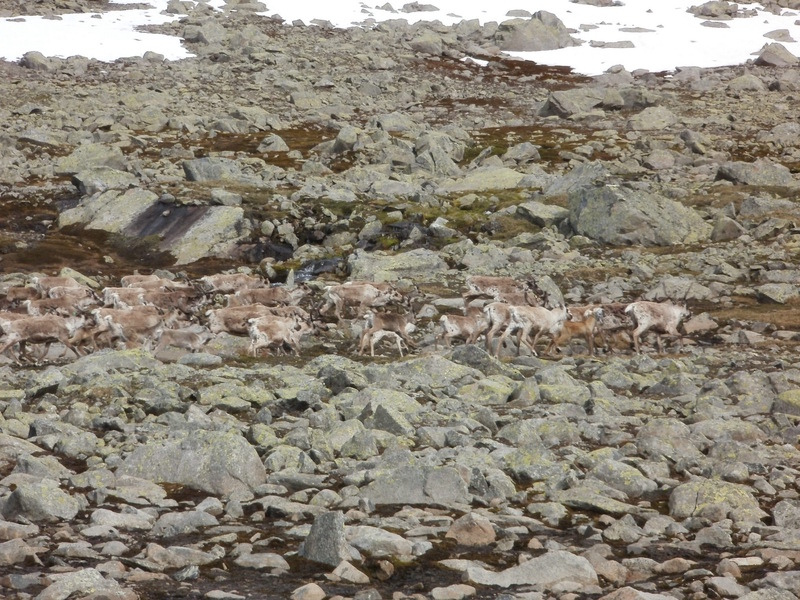 Seeing a movement out of the corner of my eye, I noticed a herd of reindeer picking their way between the rocks about a hundred yards away. Amazing camouflage! By this point the cloud had broken up and lifted above the mountain tops, although the wind didn’t really abate. Decisions on where to go next! 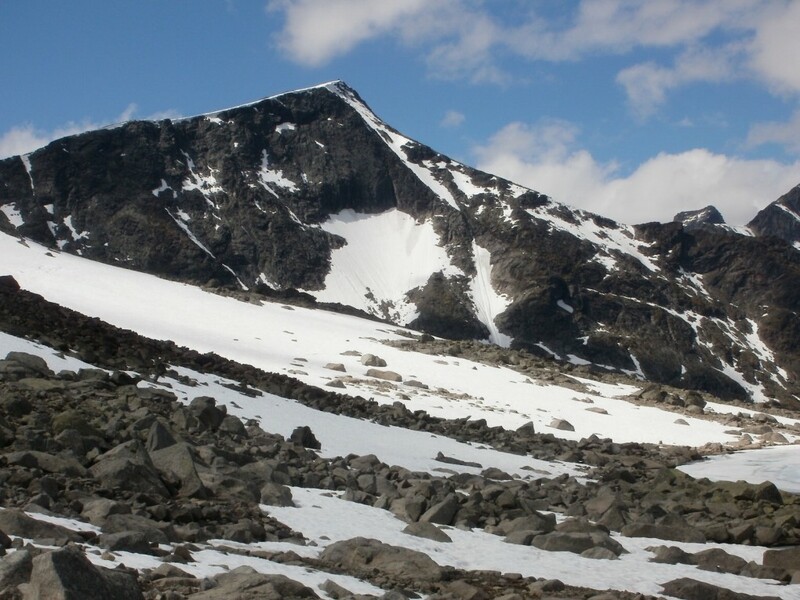 I’ve been struck by the beauty of Kvitskardtinden, the mountain in the next valley, and would love to climb it; but this would require a bit of a detour, to Torfinnsbu and Lake Bygdin. I decided to do it. The first part of the day’s walk went up over a col and then down a loose rocky path, where I met the first other backpacker I’ve seen so far. He’d walked over a hundred miles, apparently, and his rucksack was much smaller than mine! It looked more like a daysack than a proper rucksack. The walk down Torfinnsdalen was magnificent, surrounded by some truly huge glaciated peaks: Mesmogtind, Knutsholstind, the Torfinnstinden. It all felt a lot more open than the Gjende Alps. I’m now camped at an idyllic spot on the shores of Lake Bygdin (which is very much like a large Scottish loch), some way along from the Torfinnsbu hut, which I didn’t bother to look in. Now the weather is warmer and less windy I’d prefer to camp. 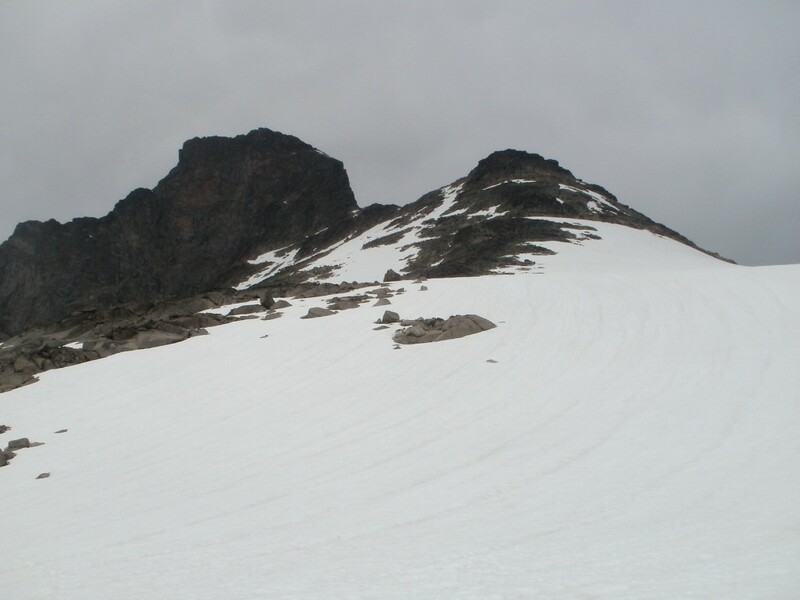 Tomorrow, weather permitting, I’ll climb Kvitskardtinden. Campsite location: As for yesterday. I’ve finally climbed a 2,000m peak! 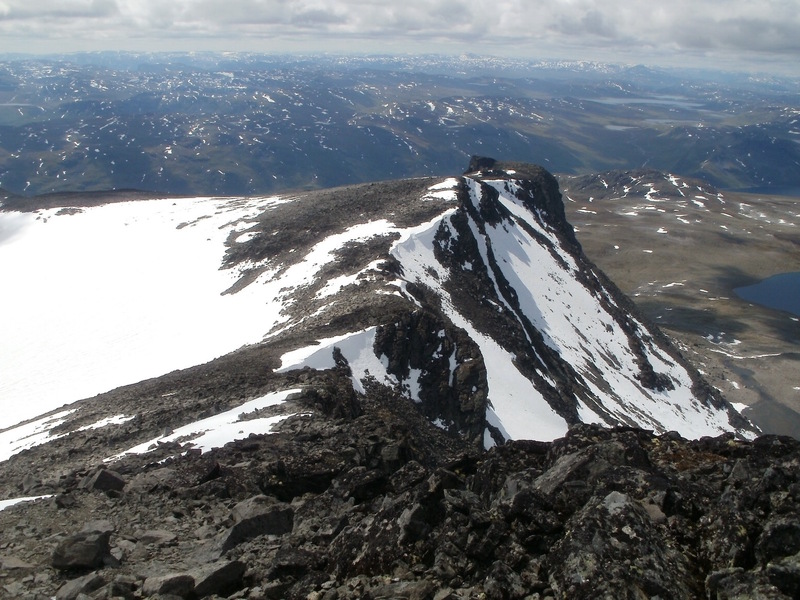 Today, thanks to the good weather, I made it to the summit of Kvitskardtinden at 2,193m. The walk in was long and scenic along a reindeer track, but this section was immediately followed by 200m of hideously steep, lichen-covered boulders. On the plus side, this vertical jumble of rock was home to a few amazing hidden gardens where alpine flowers and mosses clustered in sunny hollows between the rocks. 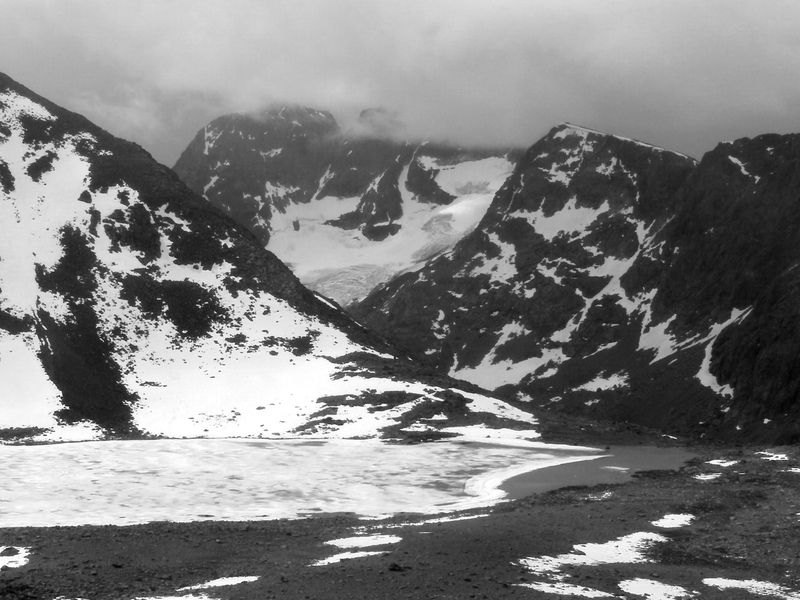 After the boulders, I found myself standing on the glacier – or, at least, the dying remains of the glacier. It’s clearly in full retreat. 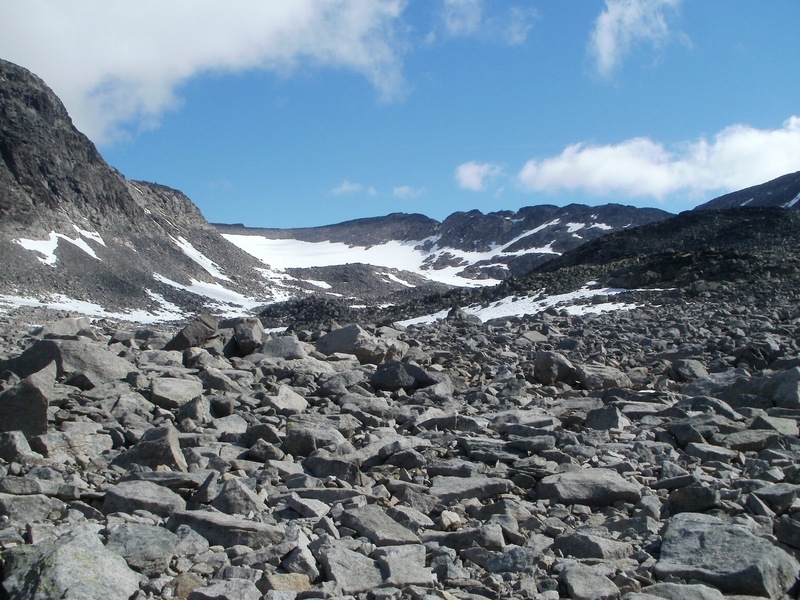 This lower section of glacier was largely composed of endless moraine, just stones for about half a mile. Once over the loose section I veered right onto the blue ice and mushy snow of the glacier proper. 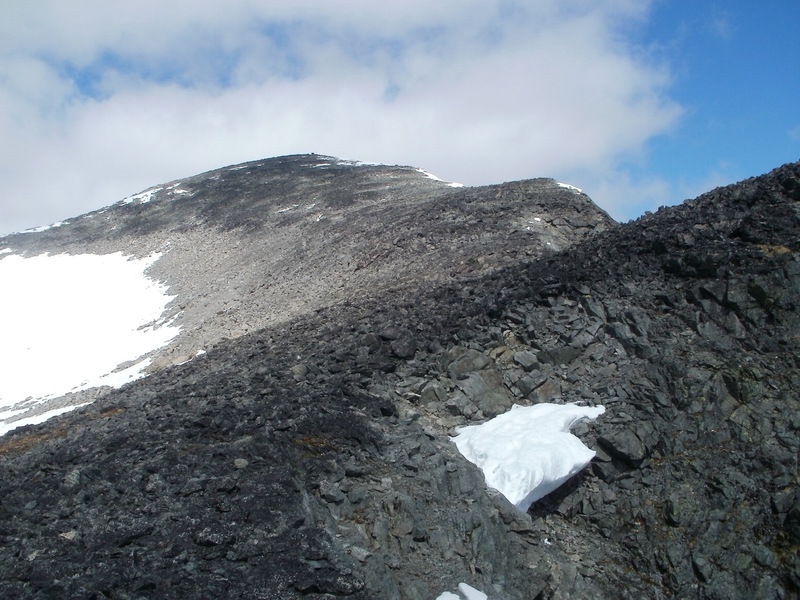 It was crevasse-free on this side, but I noted the position of some small crevasses beneath the descent ridge. Due to the warm weather and the soft snow I decided not to put my crampons on, but I needed my ice axe to get me up to the ridge. After crossing the glacier, the SE Ridge proved to be an easy scramble, Grade 1 at most. The views opened up as I climbed and I’ll admit to being a bit surprised to find a huge cairn at the top. It’s easy to forget that these mountains aren’t really unexplored and unfrequented; they’re just a bit quieter than most parts of Scotland. From the summit, many of the most prominent peaks in Jotunheimen could be seen, most impressively of all the Gjende Alps and nearby Mesmogtind, which looked absolutely impossible from that side (although there is apparently an easy route up the South Face). It’s notable that at the height of 2,193m I felt a little shortness of breath from the altitude, but no other effects. It isn’t high enough for altitude sickness, of course. I made my descent down the SW Ridge, which is a little more exposed but no more difficult than the way up. 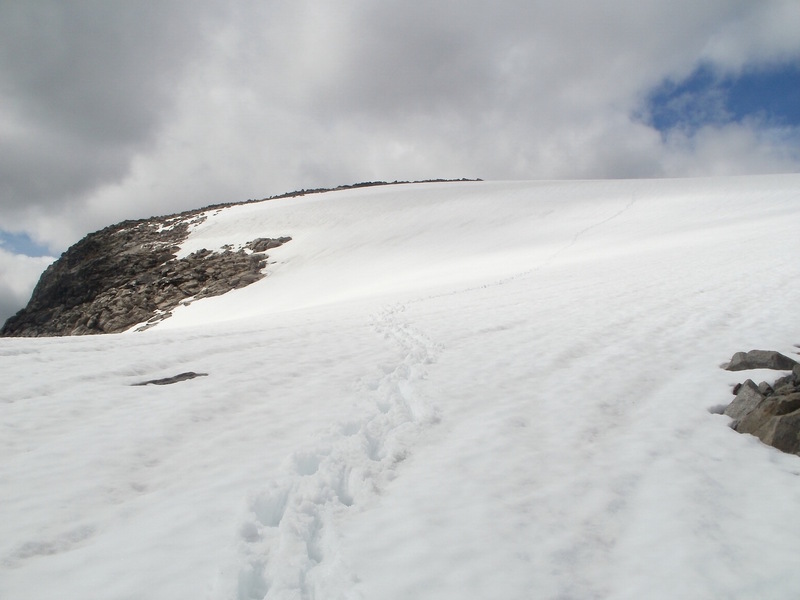 The glacial descent from this ridge was more serious, with a slope of 35-degree snow and one or two crevasses (crampons and care required). Overall I would put the full traverse at an Alpine grade of F+. Guess what? Heel blisters are back; I always seem to get them whenever I travel with a heavy pack. Or maybe it’s just these boots. Either way, I need to be careful. Tomorrow I intend to move my camp to near Fondsbu, in preparation for the journey to Olavsbu. Chucking it down with rain again now. This erratic weather is starting to get on my nerves. Weather: Rain overnight, clearing by 9.00am. Fine afterwards all day, although wind cold and at times strong. Campsite location: Eastern Raudalen, beside the lake. Despite my worries about the overnight rain, which was heavy and lasted some hours, today has been a fine day – warm sun, a little Cumulus cover, and no sign of deteriorating weather in the afternoon. Makes a change! I set off late from Lake Bygdin, once again at around 11.00am. It seems all too easy to oversleep when there is no real darkness. I’m still having trouble adjusting my sleeping pattern. The first part of today’s journey was probably the best bit of the whole trip so far. The path climbed up beneath the west side of Kvitskardtinden and Mesmogtind, past two enormous glacial lochs and a flat landscape where water flowed everywhere. I crossed a vast meadow of alpine flowers, surrounded by all the towering peaks of Jotunheimen, and above me I heard the roar and boom of crumbling seracs in the sun. There don’t seem to be many deeply carved watercourses here; often the rivers just seem to flow directly over the surface, as if the landscape is so fresh and new that there hasn’t been time for erosion to make its mark. After the meadows, I climbed up to the Slettmark Pass, which was very steep and rough – basically climbing a staircase of massive teetering boulders. Reminded me of the Cuillin. My plan was to take the Slettmark Pass over to Fondsbu, where I’d see if I could buy any provisions prior to my journey to Olavsbu. However, when I descended on the other side of the pass, I decided I had enough daylight and energy left to go all the way to Olavsbu. I made it about a mile into Raudalen before deciding to camp for the night. 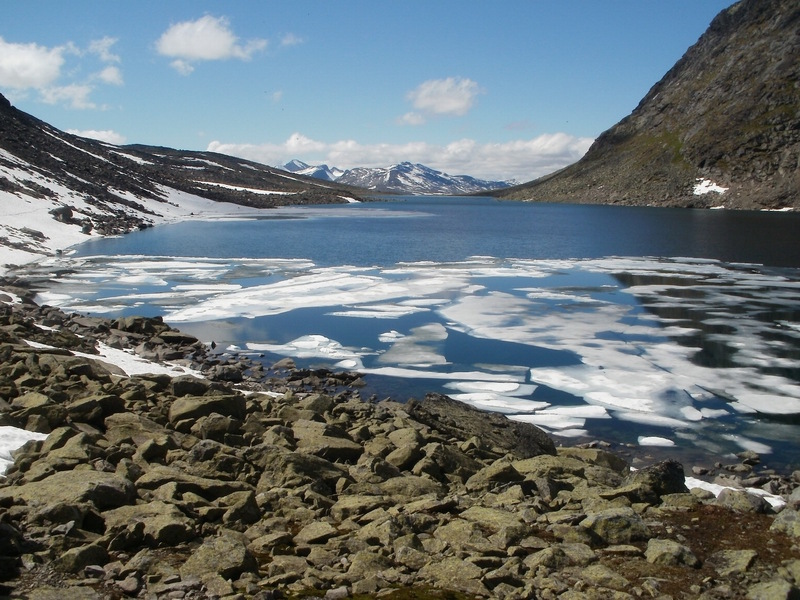 The journey from Bygdin had been long, and there are still about six miles left to Olavsbu. I’m looking forward to staying there – and I really need to stock up my food supply. My campsite tonight is in a wonderful location, on a flat bit of land above a glacial lake. There’s an icy torrent to wash in (freezing!). Excellent views of the surrounding mountains, and I can see huge glaciers spilling down from peaks I can’t even name in the distance. The weather is calm for once. I think I’m starting to get used to the isolation and complete lack of a human thumbprint on these lands. It isn’t desolation; it’s just wilderness. Weather: Dreadful. Low cloud and persistent heavy rain. High winds all day. Total mileage: 40.9. Haven’t left the campsite all day. Bloody weather has kept me marooned in the Laser Comp all day. I was up half the night trying to stop my tent blowing into Sweden, and it hasn’t let up. It’s just gone 1.00pm but I doubt I’ll have the chance to move my camp today unless the weather relents immediately. The river just behind the camp is in full spate and pretty much impossible to cross. So, I face an entire day staring at the four yellow walls of my tent. The battery on my iPod is running low, and the sunlight is too weak to use the solar charger, so it seems I’m soon to be without reading material3. To be honest, it’s on days like these – faced with sudden, unpredictable storms – that the urge to pack everything in and head for home asserts itself. Have I really flown to another country just to sit in my tent and listen to the rain, unable to venture into the mountains? There are practical issues too. Will I be able to get food at Olavsbu? I have enough food left for four days at most, if I ration them, and Gjendebu – my nearest escape point – is a full day’s walk east. Therefore, if there is no food at Olavsbu, I can remain in the mountains for only three more days before hunger (and bad planning?) forces me to retreat. That would be a shame, but on dreich days like this it almost feels like a relief. I’m starting to miss everyday things like fresh food, beer, my study, the daily writing routine. In addition, I have seen a total of one person in the last six days. When the weather is fine, this place is paradise, but when it’s like this, the emptiness and remoteness start to affect my mood. Maybe I’m just not experienced enough to have come out here with such ambitions? It isn’t Scotland – and I think I’ve only really understood that in the last couple of days. I think during my planning I focused too much on the mountaineering, which I knew I could do, and didn’t focus enough on the backpacking and wilderness skills. The rain stopped some hours ago but the wind increases by the hour. Its direction has also changed, so that it’s now blowing into the side of the tent – again – instead of the end. Conditions like this led me to abandon the first camp in Leirungsdalen. I have to hope the weather improves overnight. One way or another, I need to leave this spot tomorrow. I hope to press on to Olavsbu, but I am increasingly aware of the risk of getting stranded. Two of the river crossings on the way in will have to be negotiated in the event of a retreat, and they would be particularly nasty in high-water conditions. Further heavy rain could easily strand me at Olavsbu, where there may or may not be any food. Depending on what the weather does overnight, I need to think very carefully about whether to press on or to retreat to Gjendebu where I can catch a ferry to Gjendesheim and make a full retreat from the mountains. Weather: Low cloud, gales. Hasn’t rained for hours but winds remain dangerously high. With the noise of the tent flapping in the wind, and the constant daylight at all hours of the night, I did not sleep well. Also, the fact that I had spent the entire previous day in my tent only increased my restlessness. I’m thinking about what I should do today. It’s a really difficult decision. I could not stand another day here (my tent wouldn’t survive it, anyway – the pole is already badly bent). I would like to get to Olavsbu, but the bad weather has left me full of doubts. Walking to Olavsbu in a storm would be very risky. I decided to head back. Once I made the decision I knew it was the right thing to do, and started to feel more cheerful immediately. So I am now at Gjendebu waiting for the ferry. Predictably, the weather has turned sunny and mostly clear (although still very windy). As I have learned, though, the weather here does not follow patterns I’m familiar with, and it’s quite likely that another storm could blow in at any time. My overall impression of Jotunheimen is that it’s awe-inspiring in terms of grandeur and remoteness, but somehow not quite as good as the Scottish Highlands. The mountains are big, but the rock is rotten and covered in lichen, making scrambling more difficult. The glaciers are soft and melting. It never gets dark and for much of the day the light is very flat. At low levels scrub impedes walking, and the weather is bloody diabolical. Petty complaints? Probably, but I think it’ll take time for true perspective to reveal itself. For now all I’m thinking is that I can’t wait to get back to the Scottish hills – and the Alps – where I’m more familiar with the terrain and the challenges. And I don’t wish to give the impression that I haven’t enjoyed my time here. Quite the opposite – it’s been a remarkable adventure, to explore new ranges and experience some proper wilderness. But I somehow expected it to be better than Scotland, whereas the truth is that it’s just completely different. Weather is more of a factor here, and the ascent of any peak is a much more serious proposition, requiring greater effort and luck. I think wilderness skills are more necessary here, too. When planning the trip I think my expectations of what I’d be capable of were much too high. I looked at it from a Scottish point of view and didn’t seek out enough information. Perhaps most significantly, I failed to account for the morale factor in the face of continuous bad weather. Maybe if I had more backpacking experience I’d be better equipped to cope. I think the trip has been a success, given how much I’ve learned and experienced, and it would be all too easy to dismiss it as a failure. 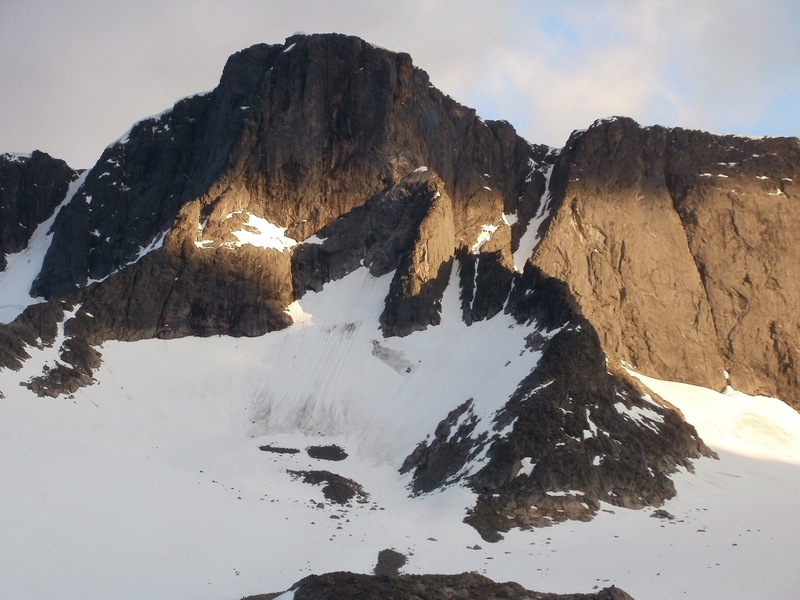 I have, after all, climbed a high, remote and glacier-bound peak alone on a perfect summer’s day – and I feel I’ve taken my first steps in a different way of enjoying the mountains altogether. Hopefully you’ve enjoyed these raw impressions, scrawled in a notebook when I was 24 years old and a far less experienced backpacker than I am today. Maybe they have made you smile! I think my final words in the journal summed up what went wrong quite well, but I do have a few things to add. Lack of experience was the big factor. Although I’d done a reasonable amount of backpacking in the UK, it was all non-serious stuff and I hadn’t even done any routes more than a couple of days long in Scotland. I was a far more experienced mountaineer than backpacker at that point. This was dangerous because I thought my climbing skills could compensate for my relatively undeveloped wilderness skills – which is of course never the case. Overconfidence during the planning stage led to unmet expectations later on. Seeking out better information, and planning more rigorously beforehand, would have solved many of my issues. Instead of going out there without a plan, I should have drawn up an itinerary beforehand and known exactly where and when I was going to resupply. My gear was inadequate and far too heavy. A lighter pack would have enabled me to walk further each day and stay out in the wilderness much longer between resupply points. I carried things like B1 mountaineering boots, bivy bag, and 12-point steel crampons that were completely unnecessary. Many of my critical items, such as my sleeping bag and tent, were poorly chosen for the conditions. If I were planning the same trip again, I’d do a few things differently. 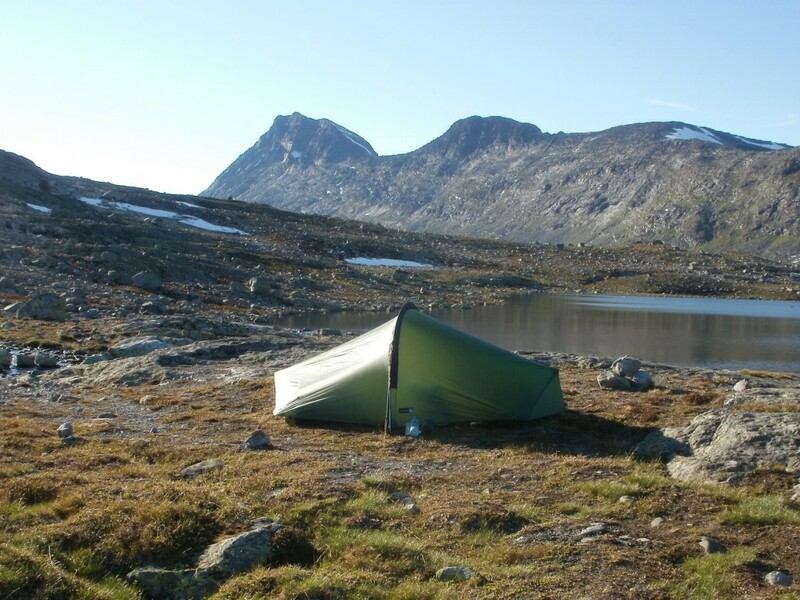 I am of course far more experienced now, with several big backpacking routes under my belt, but even so I would treat Jotunheimen with the respect it reserves. I’d plan a route based around resupply locations, with bad-weather alternatives in addition to routes up the major peaks. I would take a lightweight pack with a base weight of no more than 9kg. My entire approach to equipment would be different – I’d take light mesh trail shoes instead of big boots, Microspikes for the glaciers, maybe an ultralight axe if my route absolutely required it, and a down sleeping bag rated to freezing4. Most importantly of all, I’d use a lighter shelter built to take punishment from the weather. The MLD Trailstar would be a perfect choice. 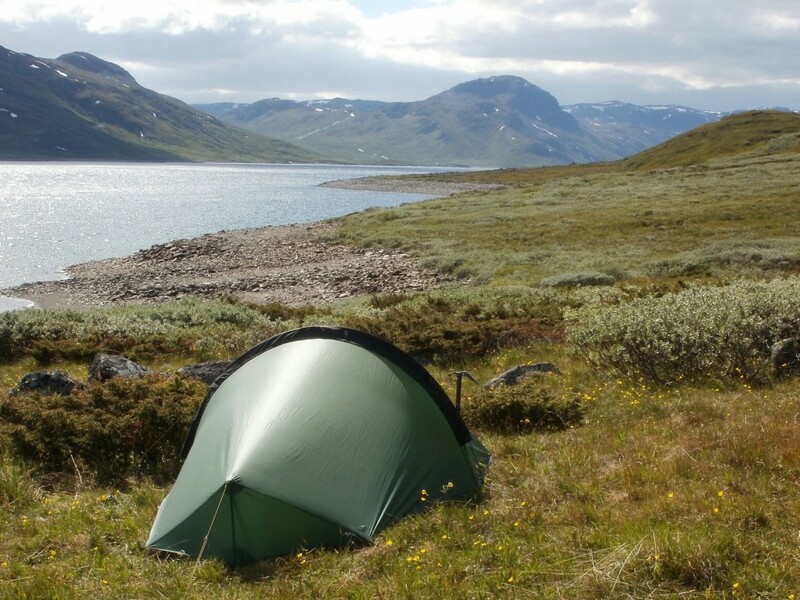 Overall, I had mixed impressions of Jotunheimen – but I loved the sense of wilderness and remoteness, and I can’t wait to return to Scandinavia this summer.